How rare is the rarest dog on earth? Apparently there are just 200 New Guinea Singing Dogs in the world, most of of which are in captivity. 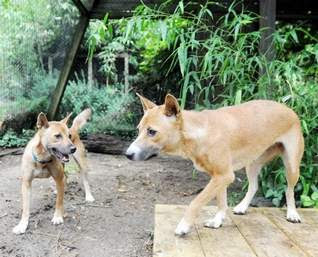 Two of these very special dogs, Lexie and Marley, were living in Illinois, but have since been moved to a shared habitat at the Cohanzick Zoo in Vineland New Jersey. 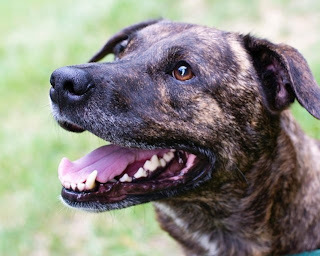 These dogs are so special because they have unique genetic differences, which means they evolved separately from all other dogs in the world. They also have a very special howl--which earns them them the appropriate name. Some still do exist in the wild in New Guinea, but the folks at the Cohanzick Zoo are not leaving the survival of this rare breed up to nature. Read more about the Cohanzick Zoo program here. 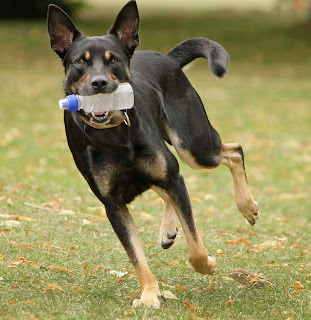 If you are interested in learning more about this breed, also check out this 4 minute Animal Planet's Dogs 101 video on the New Guinea Singing dog--where you can see Lexie and Marley in action, hear the singing, and even see a few in the wild. 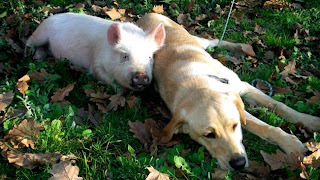 Police recently picked up an unlikely pair or Aussies: a dog and a pig! This pair was found wandering the streets of Whittlesea, Australia. Authorities were pretty sure they must have come from the same home. According to Leading Senior Constable Mick Hall "They act like a pair of pork chops when you try to separate them...They're lying all cuddled up together on the front lawn waiting for their owners." Thats right--they need to find the home that these two came from! It seems like it should be easy enough to figure out who is missing a dog AND a pig. But if they don't, I hope this adorable duo can find a new home together. You can check out the whole story, including contact info for the authorities holding the pair at News.com.au, and thanks to Life With Dogs for the image. This one has been making the rounds in the dogosphere, but it is perfect for this summer heat! If you think search and rescue is a new thing for dogs, think again! Smart dogs have been working on search and rescue missions for a long time, but didn't always get the recognition they deserved. 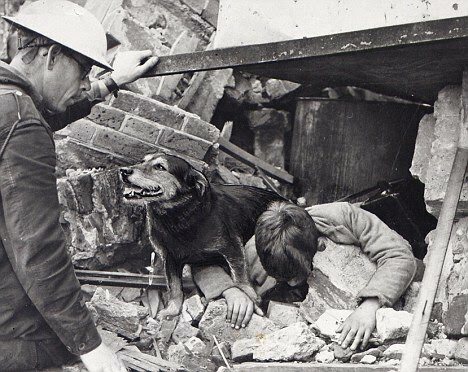 In Britain, they are trying to make right on the contribution of heroic dogs in their history. Seven dogs, known as the "Magnificent Seven" played a critical role in search and rescue missions during the London Blitz in 1940. 70 years later, these brave dogs are getting the recognition they deserve. 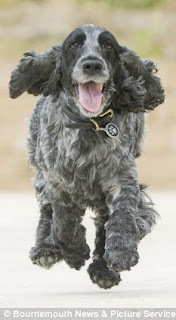 Each will be named as an awardee of the Dicken Medal by the People’s Dispensary for Sick Animals (PDSA), which is regarded as the canine version of the Victoria Cross. Rip, pictured here was originally a stray but proved to be a natural search and rescue dog. He helped rescue more than 100 people in just two years. Irma, another heroic dog of the era was convinced that she located a living person in a collapsed house, and she stood by the rubble for an entire day before rescuers pulled two young girls out. You should check out the whole article in the Daily Mail to see pictures and read more about these amazing dogs. Wags to my buddy Shep for this extra special historic tip! Dogs have evolved alongside humans in a way that no other animal can really match. In fact, it has been hardwired into our genes to imitate humans even when it is against our own self interest. Even when it means we are less likely to get treats! Scientists at the University of Vienna Department of Cognitive Biology tested this theory with 10 dogs. Discovery News provided this synopsis: "All of the dogs received preliminary training to open a sliding door using their head or a paw. The dogs then watched their owners open the door by hand or by head. For the latter, the owner would get down on the floor and use his or her head to push up or down on the sliding door. The dogs were next divided into two groups. Dogs in the first group received a food reward whenever they copied what the owner did. Dogs in the second group received a food reward when they did the opposite. 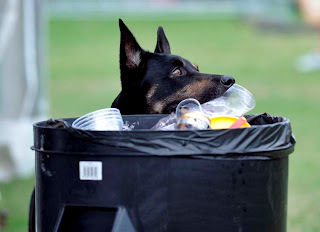 All of the dogs were inclined to copy what the owner did, even if it meant receiving no food reward." Last year, I wrote about a similar story where researchers demonstrated that domesticated dogs were more likely to be mislead by humans than wolves in the classic Piaget "A not B" experiment because we have just evolved to trust humans so much. Announcing a new semi-regular feature: The Friday Fun Post! I get nearly as many funny videos sent to me as I get news tips, so I guess my audience wants to see the lighter side of the dog world too. 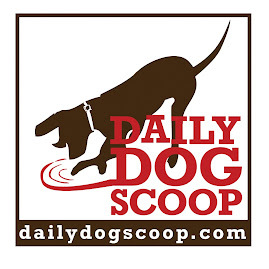 I will still stick to the serious business of dog news on most days, but if you need a daily dose of cute animal videos, be sure to bookmark YourDailyCute.com! Otherwise, check back here on Fridays for something fun! Missy knows how to look after her people. After her owner Charlie Burdon collapsed, this 11-year-old dachshund's short little legs took her to all the way across the street to their neighbor's house. There, she found Charles Mitchell working in his yard. Mitchell tried to shoo her home, but she would not leave without him. Mitchell quickly realized that Missy was trying to tell him something, so decided to follow her home. Once home, they found Charlie on the ground. He had had a heart attack last year, so Missy was right to be scared. Mitchell was able to get the paramedics there and Charlie made it to the hospital and was released the same day. Turns our he had a bad bout of vertigo, but Missy still did the right thing. The Yambill Valley News Register in Missy's Oregon hometown recognized Missy as the "new hero in the neighborhood." Mitchell told the newspaper "She did her good deed...I'd put her on the angel list if I could." 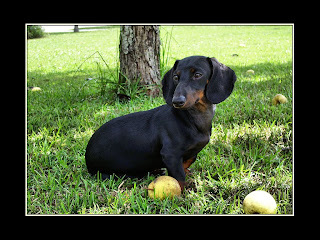 The news article did not have a picture of Missy, but here is another dachshund image courtesy of PhotoBucket. Do you remember these diplomatic dachshunds at the United Nations? Buster, the four year old chihuahua was enjoying some free playtime in his suburban backyard in Littleton, CO. It seemed like a perfectly care-free day. Until it wasn't. A coyote came into the yard and snatched up Buster and was dragging him away! Two pit bulls that lived in the neighborhood heard the commotion and did not waste any time coin to the rescue. They stared down the coyote until he realized he was outnumbered and left the injured chihuahua. These protectors laid down in the brush with Buster and licked his until his owner, Jodi Robinette arrived a few moments later. Buster did suffer severe injuries, but is expected to recover. His vet, Dr. Bregitzer told PeoplePets.com They were "guardian angels for her dog, disguised as pit bulls." Did you know that heroic Coloradan pit bulls could not move to Denver in their own home state? Yep. Pit bulls--regardless of past behavior--are victims of a blanket breed ban in the Denver jurisdiction. Maggie Marton over at OhMyDogBlog wants you to do something about it. Check out her site to learn more about the campaign to End Breed Specific Legislation, and follow the #endBSL conversation on Twitter. Maggie's precious bully Emmet, the inspiration behind the campaign, is pictured here. Pick up that garbage and put it in the trash. Ok, that last one is new. William Keating trained his dog lucky to pick up all kinds of trash on command and place it in the proper receptacle. William only had to show Lucky a few times, and he caught right on. You may ask--"But what if he finds a broken glass bottle? It wouldn't be safe for him to pick it up!" Well, Lucky has been trained for just that situation: if he locates glass, he barks twice, and William inspects it to make sure there are no sharp edges, then lets lucky go on to finish the job. Lucky and William are out around Gloucester, England for several hours a day doing more than their part to keep the neighborhood clean. Lucky is now quite popular for his work in the area. William is humble about their contribution, as he tells SWNS.com: "There’s so much litter in the world that maybe it doesn’t make a huge difference but it cheers people up to see Lucky doing his bit in the local area." I think that Lucky is doing a lot more than just picking up trash. He is showing all the onlookers that it is easy to do and you can feel good just for doing the right thing--so maybe they will think twice about littering next time. But seriously, do they even need to think once about it?! Check out more pictures of Lucky in action here. Oscar was out having a jolly time at Old Harry Rocks in southern England, until the earth seemed to fall out from under him. While on a walk, Oscar got a little carried away, and did not stop when the person accompanying him, Laura Gardener, commanded. That can be dangerous under normal circumstances, but really scary when there are 150 foot cliffs surrounding you! That's right--Oscar took a plunge down a 150 foot cliff. Amazingly, he landed at the bottom with little more than a serious startle. The next challenge was getting him back up. Gardener called the coastguard, but there was a canoeist who witnessed the whole thing already on his way over to rescue Oscar. Oscar is pictured here trotting along, hopefully somewhere safer. You can check out a picture of the cliff at Old Harry Rocks here. Oscar is resting safely at home with a sore leg, but is expected to recover just fine. Steve Williams, coastguard watchman told the DailyMail "We always advise pet owners to keep their dogs on their leads near cliffs as the animals do get excited and can fall over the edge." Sounds like reasonable advise to me. Do you rememeber Polly, who survived a 300 foot plunge?